Speculations are rising on whether North Korean leader Kim Jong-un greeted US President Donald Trump in English, upon meeting for their summit Tuesday at around 9 a.m. in Singapore. According to initial reports from the White House joint press, Kim said in English, “Nice to meet you, Mr. President,” while shaking hands with President Trump at the Capella Hotel on the island of Sentosa in Singapore. A reporter from Politico claimed to have heard Kim say those words, reporting from a short distance away. Since Kim had been sent to school in Switzerland during his younger years, a greeting in English may have been possible. However, others put forth doubts about the claim, suggesting that those words had actually come from the interpreter. The Politico reporter also acknowledged later that it may have been a mistake to say Kim greeted the US president in English. 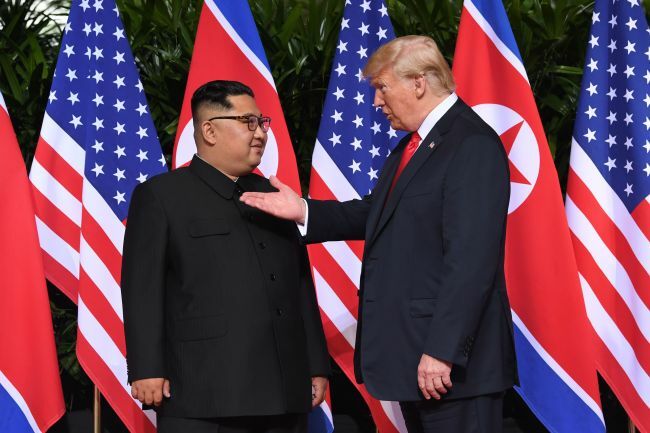 In live broadcasts of the historic summit, many of the sentences Kim spoke were inaudible, leading observers to speculate over his exact words.